The Municipal Hall of Agoncillo, Batangas. Image source: Google Earth Street View. The Municipality of Agoncillo along the shores of Taal Lake used to be part of Lemery, which in turn was also part of Taal. In 1945, a committee within the local government of Lemery prepared a resolution, subsequently approved, which would propose to the Secretary of the Interior the separation of eleven of the town’s barrios to form a new and distinct municipality. Executive Order No. 140, signed by then-President Elpidio Quirino, formally created the new town of Pansipit. However, the municipal council of Lemery filed a counter-resolution asking for the revocation of the order until a plebiscite was conducted. 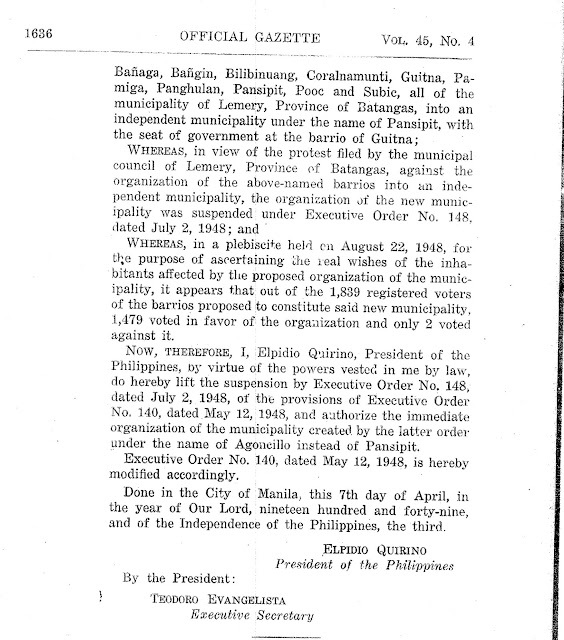 WHEREAS, in a plebiscite held on August 22, 1948, for the purpose of ascertaining the real wishes of the inhabitants affected by the proposed organization of the municipality, it appears that out of the 1,839 registered voters of the barrios proposed to constitute said new municipality, 1,479 voted in favor of the organization and only 2 voted against it. 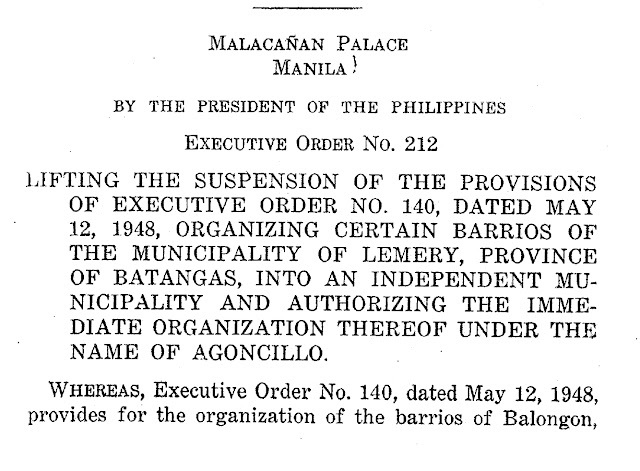 NOW, THEREFORE, I, Elpidio Quirino, President of the Philippines, by virtue of the powers vested in me by law, do hereby lift the suspension by Executive Order No. 148, dated July 2, 1948, of the provisions of Executive Order No. 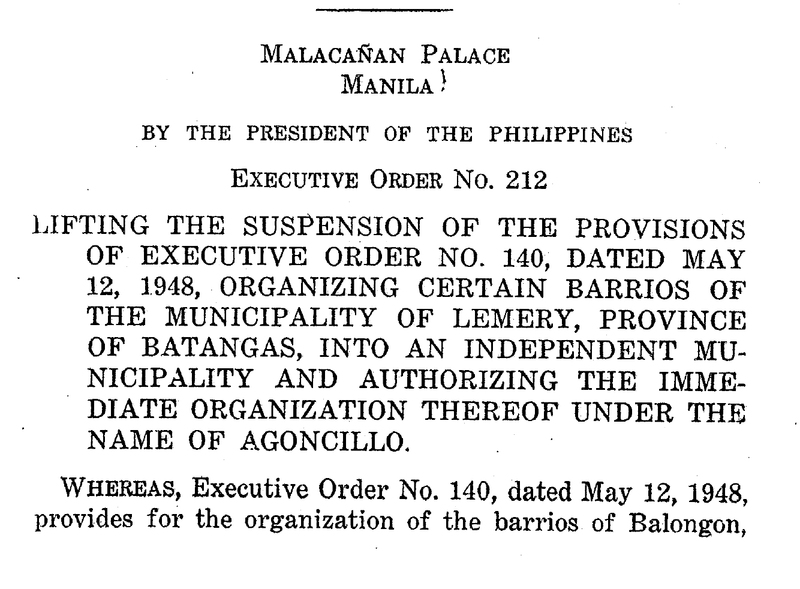 140, dated May 12, 1948, and authorize the immediate organization of the municipality created by the latter order under the name of Agoncillo instead of Pansipit. Executive Order No. 140, dated May 12, 1948, is hereby modified accordingly. Done in the City of Manila, this 7th day of April, in the year of Our Lord, nineteen hundred and forty-nine, and of the Independence of the Philippines, the third.